Monday night: Snow showers end, clearing. Lows near 30. 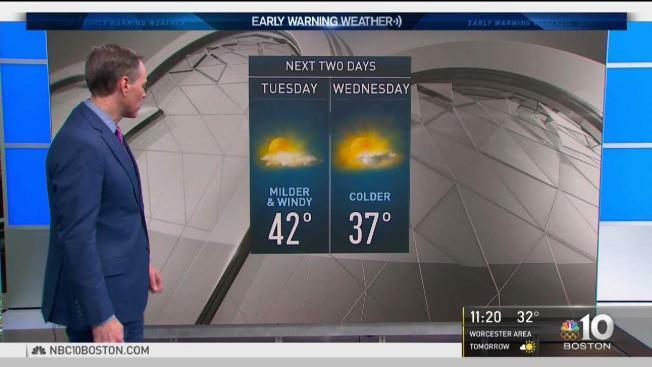 Tuesday: Sunny, windy, milder. Near 40. Wednesday: Sun gives way to clouds. Upper 30s. It’s all about the thaw! Temperatures this week are expected to rise above 50 degrees by Thursday and Friday in Boston, with even Northern New England likely to rise into the 40s by week’s end. It does take a while for us to get there... but today brings temperatures above the melting point in Southern New England for the first time since Christmas Day, even if the wind chill remains in the 20s under clouds. Periodic light snow will come and go in the mountains with a couple of fresh inches of accumulation, while late day and evening rain and snow showers fall for about 2 hours in Southern New England — just long enough to drop enough moisture that black ice may develop overnight tonight, requiring some road treatment. Even with sunshine, temperatures will stop at about 35-40 Tuesday, and hold steady Wednesday as clouds increase. With clouds Thursday and rain Friday, temperatures will jump to or above 50 degrees! This will bring melting far and wide, even into Northern New England. Clean out storm drains: You may have seen the Department of Transportation crews already hard at work, even with no snow flying this weekend... pushing the snow back. This process is multi-fold — it makes room for more, puts the melting snow farther out of the travel lanes and opens up access to the storm drains. Most of our storm drains — highway and local — are clogged with snow and ice. The combination of melting and rain later this week will cause localized flooding and ponding of water if we don’t get them opened up. Clean off flat rooftops: The snow right now, in most of New England, is not “ripe.” That means it’s capable of soaking up lots of water before melting, so incoming rain on Friday will add weight — clearing off flat rooftops will significantly decrease the weight load. Be prepared for pipe bursts: When pipes freeze, they can crack. Often, it’s the ice that keeps water from pouring out of the pipe, but once that ice melts and water pressure surges through the pipe again, bursts can happen. This will be a common situation in homes and businesses this week. Watch for mammoth potholes: The thaw — and especially the rain on Friday —will open up huge potholes. Keep an eye out and avoid big puddles... they may be disguising deep holes that could damage the car. Keep sunglasses and windshield washer fluid handy: All week, melting snow and ice will lead to water on the roads. This will result in increased solar glare on sunny days, and increased road spray on the windshield each day. As cold air squeezes back in on Saturday, moisture will continue feeding north up the East Coast and for some of us, rain will change to snow before ending... with some snow showers possible into Sunday depending on the speed of the passing front. Thereafter, cold air makes a comeback in the exclusive Early Warning Weather 10-day forecast.